Tottenham survived the absence of Harry Kane and Son Heung-min as Harry Winks’ stoppage-time header secured a vital 2-1 victory at Fulham. The striker’s ankle injury and Son’s absence due to international duty had meant a rare start for Fernando Llorente, who after scoring an own goal also missed two fine chances to make amends. Dele Alli’s seventh of the season and then one from Winks, from essentially the match’s last move, instead cruelly edged 19th-placed Fulham closer to relegation. It kept Spurs on course for a top-three finish, even thought they are under increasing pressure from Manchester United. Fulham’s attacking options had been under similar scrutiny, owing to reports of a fight between Aleksandar Mitrovic and Aboubakar Kamara during a yoga session, as well as the recent signing of Ryan Babel. With Kamara not even a substitute, Babel was handed his debut at Ryan Sessegnon’s expense, and in the 12th minute he wasted a fine chance to give his new team an unexpected lead. Racing onto Mitrovic’s flick-on from midfield, he outmuscled Davinson Sanchez and ran through to go one-on-one with Hugo Lloris before hesitating with his shot and producing no more than a routine save from the goalkeeper at his near post. Playing with greater belief and frustrating Spurs by defending deep and in numbers, the hosts required only a further five minutes to take the lead. From a right-wing corner Jean Michael Seri crossed to in front of goal, where after Tim Ream had missed a header, under minimal pressure the unfortunate Llorente attempted to clear and instead saw the ball bounce off his shin and beyond Lloris. The Spaniard very nearly found a swift response when, from Jan Vertonghen’s superb cross from deep in midfield, his powerful close-range header forced a fine reaction save from Sergio Rico, and before Babel again twice went close. First he headed over a cross from Cyrus Christie, and then Mitrovic had a goal disallowed for offside when nodding in the rebound as Lloris impressively stopped Andre Schurrle’s volley. Finally, with Spurs still uncharacteristically unconvincing, he was denied with what would have been Fulham’s best chance yet when Calum Chambers fed him with a backheel and Vertonghen produced a last-ditch challenge to block. The hosts will rarely have performed better during what has been a difficult season, but perhaps typically it was a defensive error with which they were undermined. When in the 52nd minute Ream made a hash of a clearance, after Toby Alderweireld’s hopeful long ball, Christian Eriksen collected possession on the right and calmly crossed to Alli, who then seamlessly scored with his fourth header this season. Mitrovic’s subsequent appeals for a penalty were rightly dismissed by referee Craig Pawson, who judged Lloris to have won the ball with his challenge. Danny Rose then nearly gave Spurs the lead but saw his right-footed shot deflected onto the crossbar by Denis Odoi. It was in the 82nd minute when Llorente headed narrowly wide at the back post from Rose’s free-kick and appeared to have wasted their last chance of all three points. Yet in the third minute of the three added on, substitute Georges-Kevin Nkoudou brilliantly crossed to Winks, who from immediately in front of goal dramatically headed Spurs to victory. 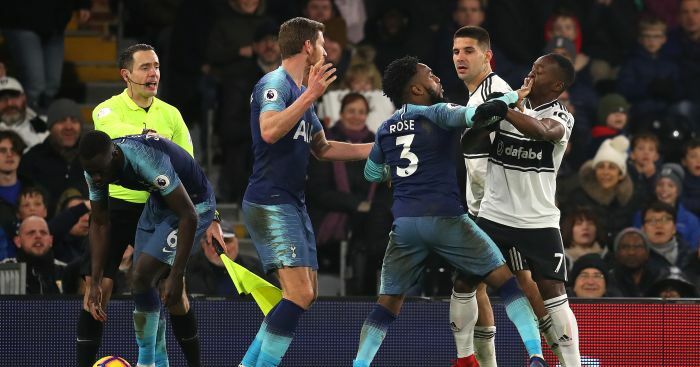 The post Winks scores at the death to give Spurs vital win at Fulham appeared first on teamtalk.com.